The Olentangy Local School District announced its selections for the fourth high school’s mascot and colors. 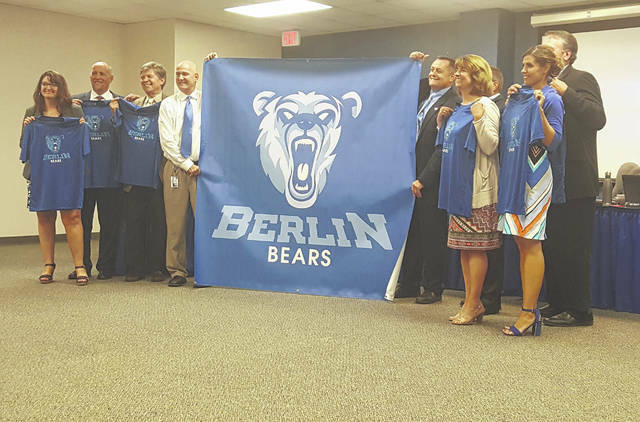 Berlin High School students will cheer for the Bears during the 2018-2019 school year, while wearing blue and light blue apparel. “The whole community did a great job because that honors the original (Berlin High School), which were the Bears,” said Berlin Principal Todd Spinner at the Olentangy Board of Education’s meeting Tuesday evening. “And the blue and the light (blue); I’m going to use the word ‘pops’ because it truly does,” he added. The Bears will join the Olentangy Braves, Patriots, and Pioneers. Olentangy surveyed about 2,500 residents of the community. Another survey was sent out to just the families of Berlin students. Those results were used to narrow down the top ten mascots and top four colors which were then presented to prospective students at two special sessions on Aug. 12. About 120 students voted on their phones for their top three choices for the mascot and colors. Spinner and district leadership used those votes to narrow down to their final selection. The other mascot options were the Generals, Express, Bison, Rangers, Buccaneers, Eagles, Bobcats, Bruins, and Hawks. The other color options under consideration were black, red, and green. School board members were presented with a bag and T-shirts as part of the reveal for the mascot and colors. The logo is a rough draft, Spinner said. The district will work with an outside firm to draft a new logo for the uniforms and T-shirts, he said. As a tradition, students can submit their drawings in a contest for the logo to be displayed on the walls. • Approved the school bus routes for the 2017-2018 school year. Olentangy Local School District officials pose with a poster to display the mascot and color selection for Berlin High School. The district’s fourth high school will open for the 2018-2019 school year. Its mascot will be the Bears with blue and light blue as its colors.